There is lots to catch up with as I have been to several shows in the last couple of weeks – all of them worthy of your time. Through July 2. 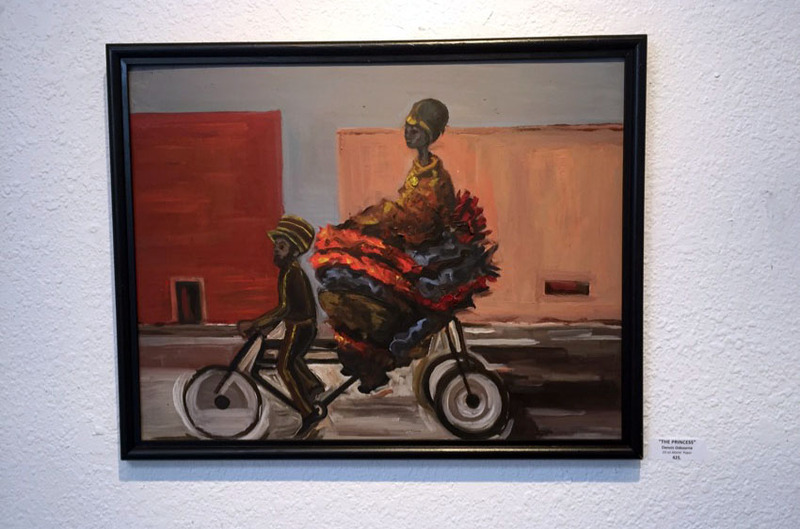 Back to the Picture, 934 Valencia St.
Monday to Saturday 10 a.m. to 6 p.m. Sunday: 12 p.m. to 5 p.m.
“Bike” includes work by more than a dozen artists who consider the bicycle in a myriad of ways including images of those who watch and those who ride. 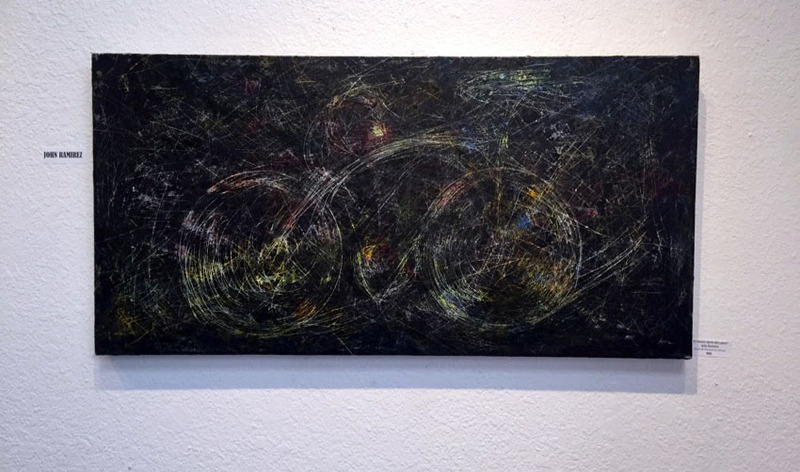 John Ramirez’s wonderful acrylic and charcoal, “At Night with No Light,” simply renders the bike as a riderless collection of lines illuminating the night. In “The Princess,” an oil on matte paper by Dennis Osbourne, a princess cushioned by petticoats sits on the back seat of a three-wheeler while a man with a hat peddles her along an empty street. The two solid and simple rectangular buildings in the background underscore the movement of pedals and the fluttering of petticoats. Jack Jacobson’s romantic, evocative etchings “Bike Rack” and “Critical Mass” are represented as are a number of photographs, including Chris Longyne’s “Drive By,” which brings together skater and biker. Given the quality, the works are modestly priced. The portraits layer cultural history on Rodríguez’s subjects. The aureole associated with images of Our Lady of Guadalupe, for example, surrounds the portrait of a young Latina titled “10 Commandments of Love.” The young woman, her hair in the pompadour of the 1960s stares out at the viewer, her face painted on one side with a small lego-like altar and on the other side with the blush of pink roses. 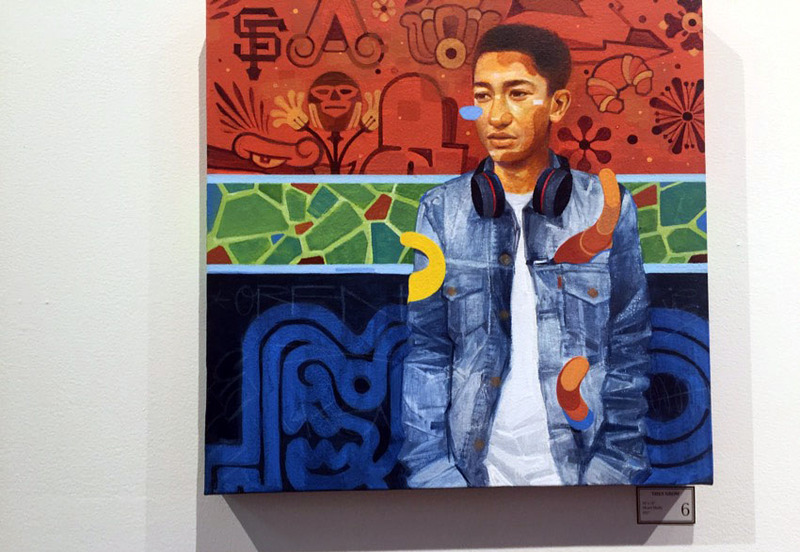 In another portrait, “They Grow,” a young man in a jean jacket, his headphones wrapped casually around his neck and a snake slithering through his jacket, stands in front of a backdrop made of three sections. The bottom and top refer to Mayan and contemporary culture. The middle section is a green mosaic. 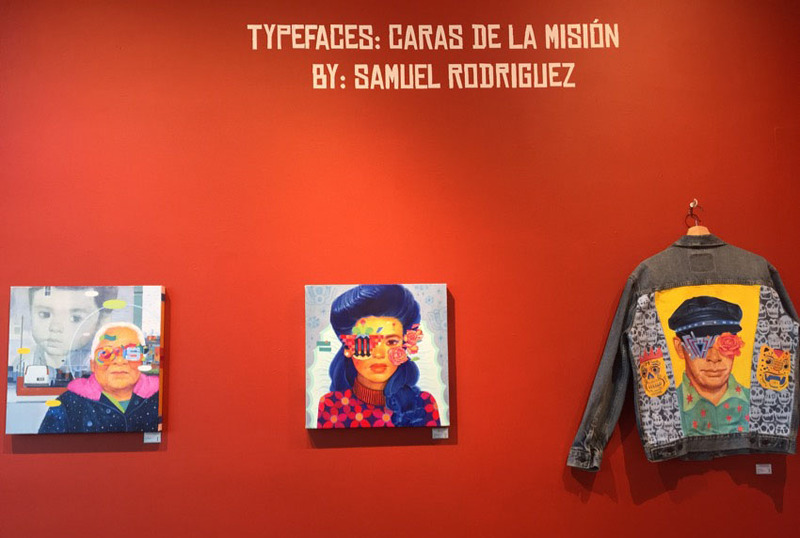 The portraits are beautifully rendered and the layering of Mission typography asks us to consider identity through icons of the past and present. Rodríguez began work as a graffiti artist and got his formal training at the California College of the Arts. On his website, he writes about his portraiture practice: “Topographical Portraits, are made by stylizing a portrait with topographical lines and shapes in a similar manner to those found through images on geographic maps. Type Faces incorporate typography and portraiture.” It’s a fine show. 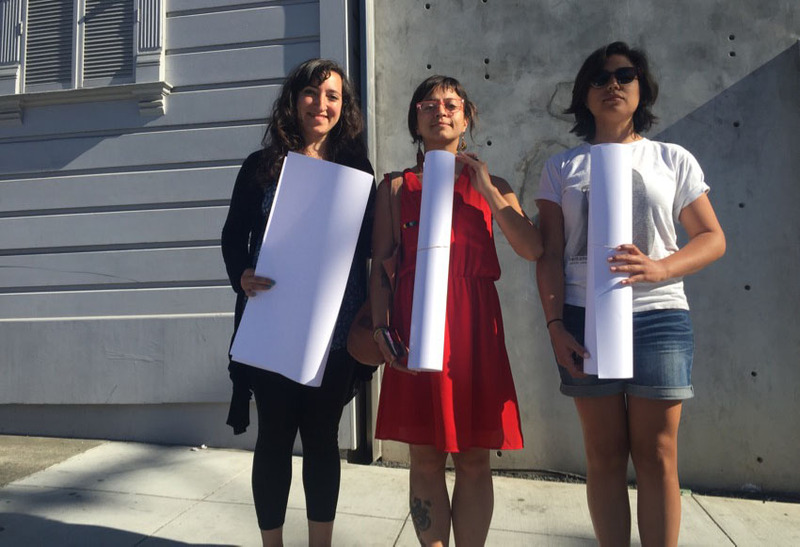 Through July 29, The David Ireland House – 500 Capp Street Foundation at 20th, tours run Wednesdays through Saturdays and begin at 11 a.m., 2 p.m. and 4 p.m. The Garage, a separate exhibition space, is free and open Saturdays from 12 to 5 p.m. I finally got around to taking the tour of David Ireland’s house at 500 Capp Street. It is a place I have long watched as Ireland passed away in 2009, the first summer of Mission Local’s existence. I had been aware of his work and the 2005 purchase of his house by Carlie Wilmans and we have reported on its evolution. I even had my David Ireland moment in 2009 when I saw a notice on the door from DPW warning the occupant to fix the sidewalk in front – the exact kind of notice that helped lead Ireland to make the house his ongoing art project. 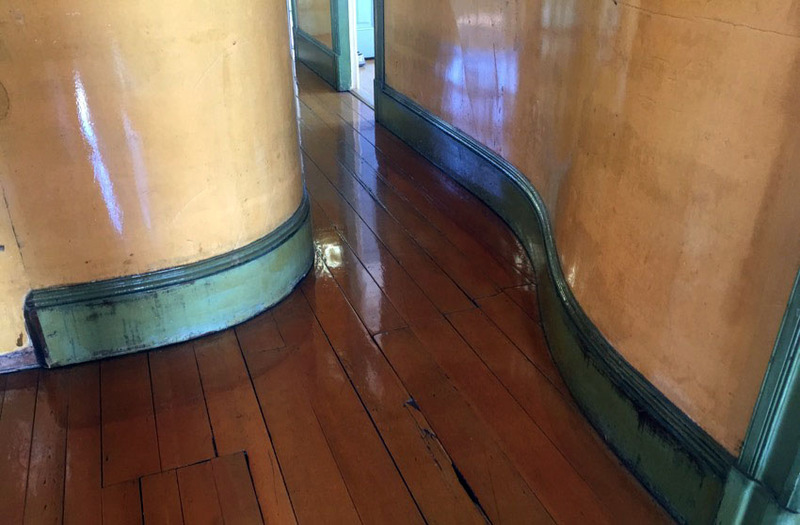 Although I had been on the first floor and sent reporters over for different tours, I had never gone through the whole house. It is not to be missed. Experiencing the lovely curve of the upstairs hallway wall alone is worth the price of admission. On our tour, two guides led four of us through the house and the current exhibit “Box of Angels” that starts on the ground floor with the plaster cast of an angel hanging horizontally along the wall – something Ireland did for his 1997 exhibition, “Angel,” at ICA, part of the Maine College of Art. 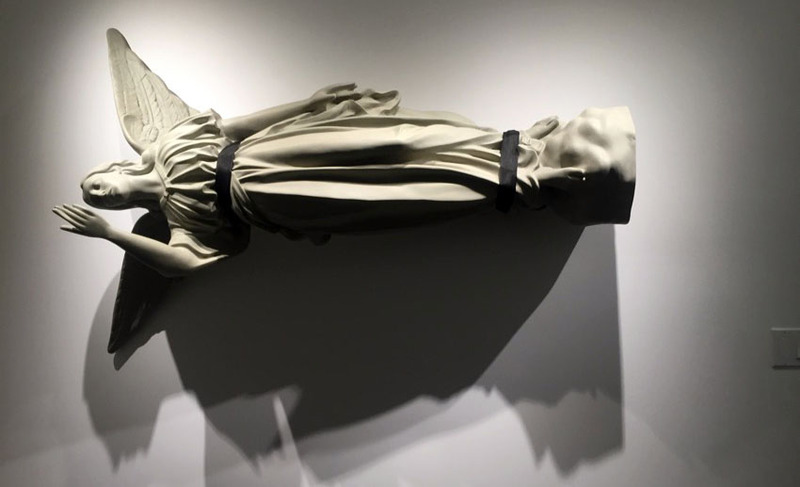 The positioning requires the viewer to reconsider the angel as we are no longer looking up in devotion, but watching her fly by or simply hang. Each room has work or objects that similarly upend assumptions about objects or materials. Surrealists juxtaposed unlike objects such as Salvador Dali’s landscape in which a limp timepiece folds over the branch of a bare tree, but with Ireland, it is not juxtaposition that makes us pay attention to the ordinary, but his repurposing or repositioning of objects. The show’s curators, Bob Linder and Diego Villalobos have recreated Ireland’s 1993 installation, “Boulevard,” in which Ireland took 130 statutes to cover the stairs and second floor of a museum. 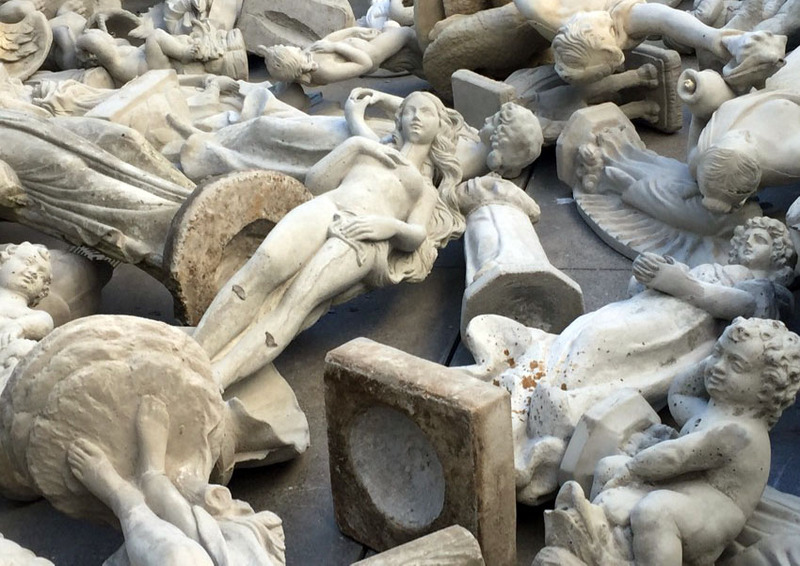 Ireland originally used mostly classical-looking statues of Venus, cherubs and a few Davids, but Linder and Villalobos add mermaids, horses, and St. Francis statuary. The plaster casts cascade along stairs to the courtyard where they pile up against one another. Oddly, the effect is not graveyard-like, but whimsical with the cascade animating the casts. It’s a wonderful show and includes one piece – as do all of the new exhibits – from another artist. Felix Gonzalez-Torres’s “Untitled” (Passport), from 1991 sits in the guest room – a 23 X 23 x 4 inch stack of blank white paper. Since my visit to the Ireland house, a new exhibit, AEROSOL, has been installed in the garage. It was organized by Patricia L. Boyd and features Bureau of Inverse Technology, Judy Chicago, Brian Moran, Charlemagne Palestine, and Gili Tal.